Home » Ask Derek the Cleric - new regular guest! 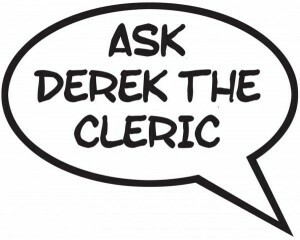 Ask Derek the Cleric - new regular guest! Updated 9:20AM, Monday March 26th, 2012	by The Editor, Christian.co.uk Be the first to comment! The life of a clergyman is such that on almost a daily basis I am required to proffer my accumulated clerical wisdom (such that it is) on all manner of situations and conundrums, be it attempting to answer how the prophet Jonah managed to survive three days inside the belly of a fish without being digested to seeking a resolve to more mundane domestic ecclesiastical dilemmas such as what is the prescribed biscuit allowance (per person) for the post-service teas and coffees. Whilst I may never be called upon to arbitrate on the weightier matter of the ownership of a child as did Solomon I feel duty bound to throw wide the doors and make my wisdom and counsel available beyond the confines of St Cliff's (my charge). To that end, if you have a thorny biblical question for which you presently have no answer or perhaps there is a more general question on matters pertaining to life, the universe and everything, then help is at hand. Simply drop me a line with the question that is causing you consternation and I will select those which I consider to be of the greatest interest to the folk who visit this enterprising internet portal to answer. "Derek, You are a legend! Full of wisdom.Church PA is a fascination of mine! How do you get on with your PA (audio) volunteers at St Cliffs? Or how do they get on with your congregation/musicians??!" Thank you for your kind words and for your pertinent question. I will readily admit that those entrusted with the weekly task of performing the technical equivalent of CPR on our somewhat antiquated public address system at St. Cliff's are rather a law unto themselves. Whilst they may be located at the rear of the church, away from the gaze of congregation, I am not the only one to have noted that once seated proudly behind the 'sound desk' they very much consider themselves the de facto captains of the ship. Having seen fit, on occasions, to not only remove from our worship team the necessary amplification with which to drown out the accompaniment of our less-then-melodious organist, Mrs Higginbottom, (patently preferring a more traditional approach to church music) these custodians of the volume control have also, on occasion, denied yours truly the benefit of the voice-enhancing technology at their fingertips when my theology did not apparently square with theirs. And then I hit upon a cunning ruse to curtail this scurrilous sound desk insubordination once and for all. Realising that there was nothing that irritates a PA operative more than for a preacher to ask , "Is it on?" (when referring to the microphone) I therefore resolved to use this line mercilessly until they eventually capitulated. These three little words have the net effect of challenging their technical competence before the assembled throng, the most heinous of crimes in the world of audio 'geekery'. You will be pleased to hear that my victory was swift and enduring and once more this humble clergyman is at the helm. Should a further mutiny rear its ugly head at some time hence I will have no qualms about using my other weapon, that of suggesting the congregation proffer feedback on how well these servants of the sound system are doing their job. I have it on good authority that, above all others, 'feedback' is one word that no PA operative ever wants to hear.